The next few decades will see a profound energy transformation throughout the world. By the end of the century (and perhaps sooner), we will shift from fossil fuel dependence to rely primarily on renewable sources like solar, wind, biomass, and geothermal power. Driven by the need to avert catastrophic climate change and by the depletion of easily accessible oil, coal, and natural gas, this transformation will entail a major shift in how we live. What might a 100% renewable future look like? Which technologies will play a crucial role in our energy future? What challenges will we face in this transition? And how can we make sure our new system is just and equitable? In Our Renewable Future, energy expert Richard Heinberg and scientist David Fridley explore the challenges and opportunities presented by the shift to renewable energy. Beginning with a comprehensive overview of our current energy system, the authors survey issues of energy supply and demand in key sectors of the economy, including electricity generation, transportation, buildings, and manufacturing. In their detailed review of each sector, the authors examine the most crucial challenges we face, from intermittency in fuel sources to energy storage and grid redesign. The book concludes with a discussion of energy and equity and a summary of key lessons and steps forward at the individual, community, and national level. The transition to clean energy will not be a simple matter of replacing coal with wind power or oil with solar; it will require us to adapt our energy usage as dramatically as we adapt our energy sources. 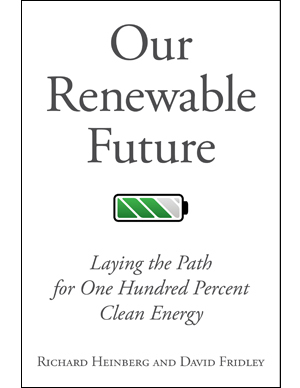 Our Renewable Future is a clear-eyed and urgent guide to this transformation that will be a crucial resource for policymakers and energy activists. Published by Island Press. 2016. Paperback 248 pages. ISBN: 9781610917797. Use discount code 4RENEW for 20% off your purchase of the printed book at Island Press. Our Renewable Future from Security & Sustainability Forum on Vimeo.